Sunlight pours through south-facing windows, bouncing off spring green accents in West Seattle’s homey new lunch spot. Opened in March by Carrie Duncan (maker of Alki Girl granola) and Dana Moreland, Fiddlehead attracts a mishmash of parents and tots, and small groups of elderly friends, gathering to lunch on a fine BLT made with thick-cut bacon, served on a warm, soft buttermilk biscuit ($7.95), or the even better veggie sandwich, with herby cream cheese and a pile of delicious roasted veggies ($8.75). 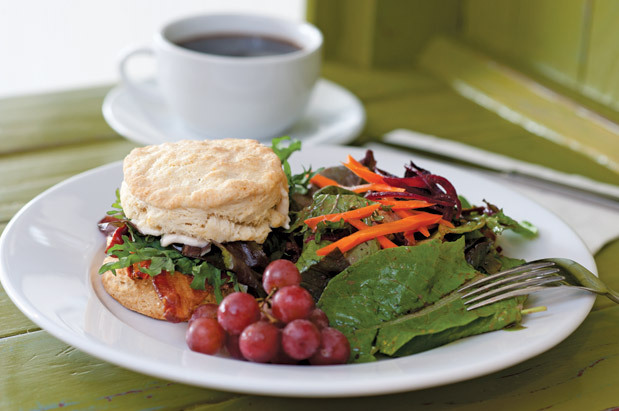 Breakfast is an indulgent and popular affair, especially for the breakfast sandwiches served on those great biscuits, or the freshly baked biscuits smothered in gravy ($9.50). Big, chewy cookies and bar cookies tempt, too.